Born in Fülek, Hungary, in 1869; son of the Talmudist rabbi Phineas Büchler of Moór. He was educated at the gymnasium in Székesfehérvár and at the university and the seminary of Budapest; he received the degree of Ph.D. in 1893, and was ordained as rabbi in 1895. In 1897 he was called to Keszthely. 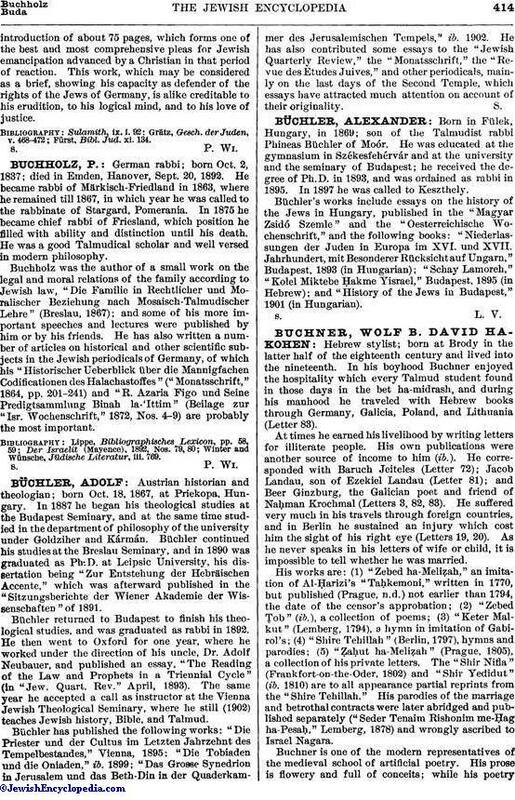 Büchler's works include essays on the history of the Jews in Hungary, published in the "Magyar Zsidó Szemle" and the "Oesterreichische Wochenschrift," and the following books: "Niederlassungen der Juden in Europa im XVI. und XVII. Jahrhundert, mit Besonderer Rücksichtauf Ungarn," Budapest, 1893 (in Hungarian); "Schay Lamoreh," "Kolel Miktebe Ḥakme Yisrael," Budapest, 1895 (in Hebrew); and "History of the Jews in Budapest," 1901 (in Hungarian).